Guided, public tours of the Leopold Shack and Farm: Tuesdays through Saturdays at 1 pm, June 17 through Labor Day weekend. 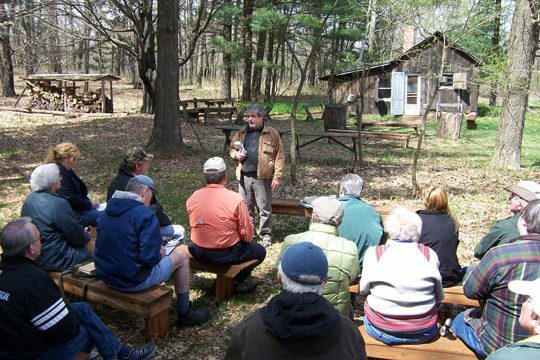 Guided public and self-guided tours are free for members of the Aldo Leopold Foundation. Our most popular tour offering, guided public tours of the Leopold Shack and Farm are offered on Saturdays at 1:00 pm from April 20th through October 26th. During peak season, June 17th through August 30th, weekday tours are also offered. (Monday – Saturday at 1:00 pm). Guided tours last approximately two hours and are led by knowledgeable guides. The land surrounding the Shack was the chief inspiration for Aldo Leopold’s essays in A Sand County Almanac and continues to be a living classroom for exploring ecological relationships and conservation history. Come hear stories about the pioneering restoration work initiated by Leopold and his family, see the inside of the Shack, and stroll through restored prairie and woods along the Wisconsin River. Guided public tour fees are $15 for adults; $10 for seniors (age 62 and older); and $8 for children (ages 11-17). Tours are free for Aldo Leopold Foundation members and children 10 years old and younger. We appreciate advanced registration for tours and recommend them for Saturdays. Please note that public tours may not be available on some Saturdays due to special events. Saturday 1:00 pm guided tours will resume on April 20, 2019. Reserve your spot today! Can’t make it when we have a guided tour scheduled? Self-guided tours of the Leopold Shack and Leopold Center are available anytime during our visiting hours. However, because access to the Shack is sometimes closed due to special events or weather conditions (e.g., heavy snow cover in winter), we recommend calling ahead: 608.355.0279. Visitors to the Leopold Center should also feel free to explore our exhibits and trails. Self-guided tours of the Shack are permitted year-round during visiting hours, except at times of heavy snow cover in winter. You must check in at the Leopold Center first before heading out on a self-guided tour of the Shack. Self-guided visitors explore the Shack and surrounding land guided by a brochure that includes a trail map, historic photos of the land, and background information on Aldo Leopold’s history and legacy. The trail loop on the property is approximately one mile in length. A side trail leads to the Wisconsin River through a beautiful floodplain forest, where bald eagles, cranes, and other wildlife are frequently spotted. Note that the Shack itself is shuttered and locked during self-guided tours. Self-guided tour fees are $7 per person. These tours are free to Aldo Leopold Foundation members and children aged 10 and younger. When the Leopold Center opened in 2007, it was among the “greenest” buildings in the nation – a 21st-century reflection of Aldo Leopold’s land ethic. Self-guided audio tours of the Leopold Center are available anytime during our visiting hours. Made possible by a grant from the National Association for Interpretation, Region 5, this 42-minute, audio tour takes you throughout the center, describing in detail the design techniques, alternative energy technologies, and green building materials that were used to construct it. If you are an Aldo Leopold Foundation member or have already paid admission to another guided or self-guided tour, there is no charge for the audio tour. Are you visiting with a group? You can schedule your own tour of the Shack and Farm or Leopold Center on any dates and times that we’re open to the public.